Presenting Apple Pie as easy as 1-2-3-4! With four easy steps, your little chef will be proud to assemble and present this All-American dessert favorite! Place the bottom crust in the pie plate, fill with the apple slices, then put the top crust into place..."bake" and serve...easy as pie! 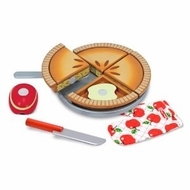 The set comes with all the ingredients, an oven mitt, wooden knife, pie server and the pie plate.